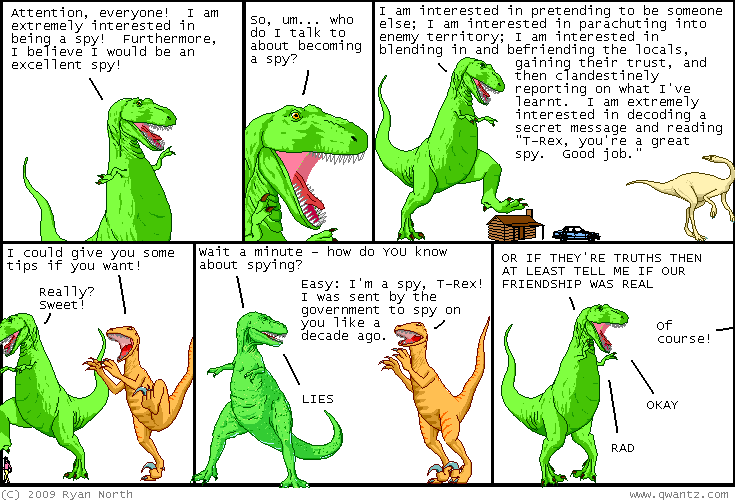 Dinosaur Comics - June 25th, 2009 - awesome fun times! June 25th, 2009: I got a few emails about The Lyttle Lytton Contest, which is a contest where you make up the first line of a novel. If you're interested in funny first lines, I recommend it! The problem with funny first lines is that, if you're expecting a joke, often they're not AS funny as they would be otherwise - BUT THAT SAID, I still think this runner up from 2007 is great: "The foot delivered an unending holocaust of pain as it rocketed into Zamboni’s crotch." PRO TIP: the first time I typed that I wrote "unending holocaust of paint"
Okay so this movie has been floating around lately and GUESS WHAT I really like it too! Please Say Something. Enjoy! One year ago today: i am on a diet and i now look at going to the bathroom as the easiest way to lose weight. it's gross! i know!